By Eric Thomas: Former WBC welterweight champion Victor Ortiz has been ordered by the Nevada State Athletic Commission on January 11th to explain his comments about how he was trying to break Floyd Mayweather Jr’s nose when he head-butted him in their fight last September. If Ortiz doesn’t do a good job explaining why he made the comments then he will won’t receive his license to fight former IBF/WBC welterweight champion Andre Berto in a rematch on February 11th at the MGM Grand in Las Vegas, Nevada. It’s a good thing that Ortiz is meeting with the commission this early because it may be difficult for Ortiz and Berto’s promoters to move the fight to a different state if the commission decides against Ortiz receiving his license again. Ortiz does have a couple things going for him. He’s young and hasn’t had a prior history of fouling his opponents before this fight. Ortiz head-butted Mayweather in the 4th in what looked like a move of frustration on Ortiz’s part. He was starting to get dominated by Mayweather and he seemed to lose his cool after missing a handful of punches when he had Mayweather against the ropes. Referee Joe Cortez took a point away from Ortiz for the blatant foul, and Ortiz made things worse by apologizing twice to a testy Mayweather. When Ortiz apologized for the second time, Mayweather used the opportunity to tag him with a left-right combination while Ortiz’s hands were still down after having hugged Mayweather. It looked bad but the referee Cortez had called time in and Ortiz made the mistake of trying to apologize even after the fight was restarted. Ortiz said he was trying to break Mayweather’s nose when he headbutted him. The reason he did so was because he claimed that Mayweather had elbowed him 16 times in the fight without having points taken off. 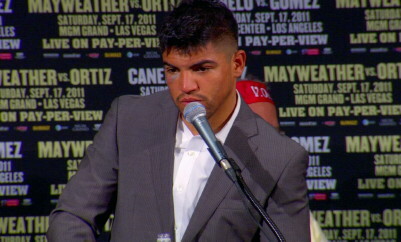 Ortiz was upset that Cortez failed to control Mayweather even after he told Cortez to watch for the elbow. Cortez did nothing and just told Ortiz to keep fighting. That’s when Ortiz decided to take things in his own hands by headbutting Mayweather. It’s not likely that the Nevada commission will keep Ortiz from getting his license to fight in that state, because there’s too much money to be made and there isn’t any history of Ortiz having fouled people like this before.